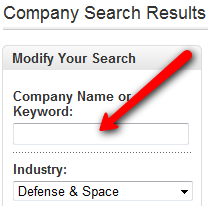 LinkedIn Sourcing Tip: Searching by Company? Beware! Recently, I wrote about the intrinsic issues associated with searching LinkedIn for potential candidates with specific industry experience, and how using the “Industry” field can actually prevent you from finding the people you’re looking for. A number of readers responded by suggesting a logical solution to the issue – searching by specific company name(s) instead of using LinkedIn’s “Industry” field. It is a logical solution, but a potentially flawed one nonetheless. I’m going to show you some reasons why, and if you read this post within the next 5 minutes, I’ll even throw in a LinkedIn company search anomaly as an added bonus. I agree that when sourcing candidates on LinkedIn you need to use the fields that most profiles have completed – but from my research, it does appear that when you create a LinkedIn profile, you actually do have to choose an industry. 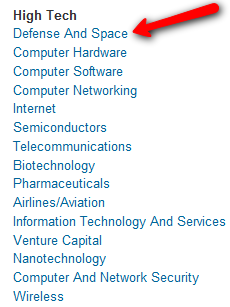 I tried not selecting an industry and leaving it at “Choose industry” and LinkedIn would not allow me to save my profile without selecting one from the list – I got an angry red “Please enter a value” for my efforts. So it appears that every LinkedIn profile will actually have an industry selected – but the issue remains that it may not be the industry you’d assume people would use. I agree with William that searching by keyword is not reliable – there are many LinkedIn profiles that do not have any text entered into the description field under each work experience. I’m curious to know the exact percentage of these “skeletal” LinkedIn profiles that only have company names and titles entered, but something tells me LinkedIn wouldn’t be motivated to release that number. If I had to hazard a guess based on my experience searching LinkedIn, I’d say at least 40%. Searching LinkedIn using the “Company” and “Title” fields as William suggests generally does yield good results. However, with these fields we are dealing with user generated content. Instead of choosing from a fixed list (which has its own set of issues), people can choose to enter whatever they want into these fields – and it may not be what you’d assume. For some companies, there may only one way in which a company’s name can be expressed/written. However, there are many companies where people can and do write the company names in a wide variety of ways – not only on LinkedIn, but on their resumes as well. 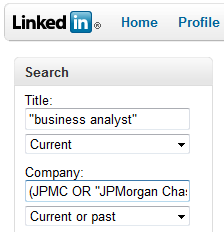 Let’s say you were looking for people with experience in the Financial Services industry, and after reading my recent article on the industry search issue, you wisely realized that people who work in the Financial Services industry might not actually select that industry when they create or modify their LinkedIn profile. So instead, you start thinking of target companies to search for using the “Company” field. So you start selecting companies, and let’s say one of the companies you’d like to target is JPMorgan Chase. If you’re a regular reader of my blog, you’d know that the first thing you’d need to do is obey the Cardinal Rule of E-Sourcing, which states that for every term you are thinking of including in your search, consider how many ways it can be expressed. There might even be more (such as WAMU, etc.) – but my point here is that if you go beyond searching by industry (which you actually have to), you must be careful to think of all of the various ways people who have worked in your target industry and target companies could possibly express that experience. If you don’t – you create Hidden Talent Pools of candidates that exist in LinkedIn (or wherever you search), and you cannot find them. If you were looking for people with big pharma experience, you might want to target GlaxoSmithKline. To do so, you’d quickly and correctly assess the fact that not everyone who has worked for GlaxoSmithKline will actually write it that way on their LinkedIn profile (or resume). If you didn’t think of those alternate ways of expressing experience working for GlaxoSmithKline, you quite simply would not and could not find those candidates. You would not even be aware that they exist. If I haven’t got your mind racing on how you can apply this process to your own sourcing efforts, perhaps thinking that I picked a couple of “ringers” with JPMC and GSK – think again. This phenomenon isn’t limited to any particular industry, nor is it limited to the more obvious companies such as PricewaterhouseCoopers (PWC, “Pricewaterhouse Coopers,” etc.). In fact, inherently one-word company names aren’t immune either. Yeah – there’s a couple hundred of those in the U.S. alone on LinkedIn. Trust me – your target industry and at least some of your target companies are not immune to this principle. In fact, it’s highly likely that you’ve been missing candidates in your sourcing efforts for a long time now because of the intrinsic issues associated with user generated content. Let’s not forget all of the people who don’t actually list the names of the companies they’ve worked for. If you’re searching by company name, you simply cannot find people who actually work for your target company but do not list the company, who instead use “confidential” as their employer. There’s over 5,000 U.S. LinkedIn profiles like this. Remember that LinkedIn anomaly I alluded to in the intro of this article? … you’d get 50 results. 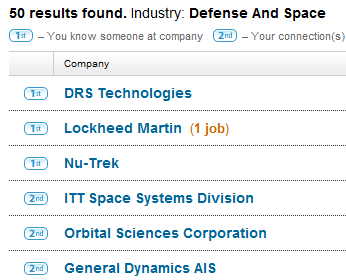 But do you think there are only 50 companies in the defense and space industry represented on LinkedIn? 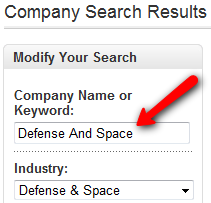 I didn’t type in “Defense And Space” – LinkedIn did it for me. LinkedIn will do it for any industry you choose – try it for yourself. I got almost 1700 companies. That strikes me as more accurate than 50. Well, it should be – because anyone who uses LinkedIn’s quite robust company search/research functionality (you do, don’t you?) may be getting seriously short-changed in their search results if they don’t delete the auto-populated keywords and re-run their searches when attempting to get comprehensive lists of companies in target industries. 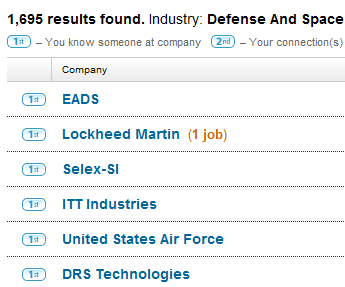 I have reason to believe that at least a couple of LinkedIn employees read my blog. Let’s see how quickly they fix this anomaly. Hidden Talent Pools (Google the term) are very real. If you’re not careful to stop to think before you search, you can all to easily and unknowingly create pools of candidates that you cannot and do not find. But they’re there. LinkedIn, Facebook, Twitter – any social network profile consists mainly of free form user generated content (just like resumes), and when people have the ability to enter whatever they think is appropriate to describe their employers and work experience, you’re going to get a wider variety than you might assume. Before you conduct ANY search – take a moment to think about all of the various ways your quarry could possible express what it is that you’re looking for. Oh – and one last thing: What I’ve detailed in this post also applies to X-Ray searching LinkedIn for people who have worked at specific companies within a target industry as well. At his suggestion, I installed the WPtouch plugin and now the site is much easier to read and navigate on iPhones, BlackBerries and other smart phones. From this point on, if you ever read my site using your mobile device – you owe your enhanced mobile BBB experience to Eric!